Anacreon (Greek: Ἀνακρέων) (born c. 570 B.C.E.) was a Greek lyric poet, notable for his songs, hymns, and personable poems celebrating the lighter side of life. Like Archilocus, Anacreon is notable for writing about personal matters drawn from life, in sharp contrast to the predominantly mythological and historical poetry that dominated most of ancient Greek literature. Although only fragments of Anacreon's oeuvre has survived to the present day, it is clear that he was highly influential figure due to his inclusion in the group of the nine canonical poets of ancient Greece by later scholars. Anacreon would not be rediscovered until the 16th-century, when his surviving works were compiled, translated and published in France and England. 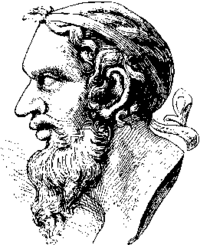 Like other poets of ancient Greece, Anacreon would exert a considerable influence on the development of Classicist poetry in the 16th, 17th and 18th centuries throughout Europe; like Sappho and Archilocus, Anacreon's contribution to the progress of Western literature endures even though his works are almost entirely lost. Anacreon was born at Teos, an Ionian city on the coast of Asia Minor. Little more is known of his life. It is likely that Anacreon fled into exile with the mass of his fellow-townsmen who sailed to Thrace when their homeland was attacked by the Persians. There they founded a colony at Abdera, rather than remaining behind to surrender their city to Harpagus, one of Cyrus the Great's generals. Anacreon seems to have taken part in the fighting, but by his own admission he did not distinguish himself in battle. From Thrace he moved to the court of Polycrates, King of Samos. He is said to have acted as tutor to Polycrates; that he enjoyed the king's confidence we learn on the authority of Herodotus (iii.121), who depicts the poet as sitting in the royal chamber when an audience was given to the Persian herald. In return for his favor and protection, Anacreon wrote many complimentary odes upon the subject of his patron. Like his fellow-lyric poet, Horace—who was not only one of his great admirers, but in many respects a kindred spirit—Anacreon seems to have been made for the society of courts. On the death of Polycrates, Hipparchus, who was then in power at Athens and inherited the literary tastes of his father Peisistratus, sent a special embassy to fetch the popular poet to Athens in a galley of fifty oars. Here he became acquainted with the poet Simonides, and other members of the brilliant circle which had gathered round Hipparchus. When this circle was broken up by the assassination of Hipparchus, Anacreon seems to have returned to his native town of Teos, where—according to a metrical epitaph ascribed to his friend Simonides—he died and was buried. 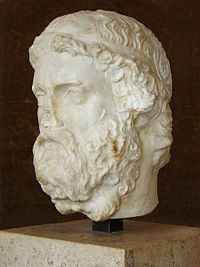 Anacreon was popular for a long time at Athens. His statue was seen on the Acropolis, together with that of his friend Xanthippus, the father of Pericles. On several coins of Teos he is represented holding a lyre in his hand, sometimes sitting, sometimes standing. Anacreon wrote all of his poetry in the ancient Ionic dialect. Like all early lyric poetry, it was composed to be sung or recited to the accompaniment of music, usually the lyre. Anacreon's verses were primarily in the form of monody, which means that they were to be performed by a single voice rather than by a chorus. In keeping with Greek poetic tradition, his poetry relied on meter for its construction. Metrical poetry is a particularly rhythmic form, deriving its structure from patterns of stress within and between the lines of verse. The stresses in Anacreon's poetry, like all the Greek poetry of the day, are found in the use of "long" and "short" vowel sounds. The Ionic dialect also had a tonal aspect to it that lends a natural melodic quality to the recitation. The Greek language is particularly well-suited to this metrical style of poetry but the sounds of the verses do not easily transfer to English. As a consequence, translators have historically tended to substitute rhyme and poetic forms for the style of the originals, with the primary, sometimes only, connection to the Greek verses being the subject matter. More recent translators have tended to attempt a more spare translation which, though losing the sound of the originals may be more true to their flavor. A sample of a translation in the English rhyming tradition is included below. Anacreon had a reputation as a composer of hymns, as well as of those bacchanalian and amatory which are commonly associated with his name. Two short hymns to Artemis and Dionysus, consisting of eight and eleven lines respectively, stand first amongst his few undisputed remains, as printed by recent editors. A collection of poems by numerous, anonymous imitators was long believed to be the works of Anacreon himself. Known as the Anacreonteia, it was preserved in a tenth-century C.E. manuscript which also included the Palatine Anthology. The poems were later translated into French by Henri Estienne, known as Stephanus, but little is known about the origins of the manuscript. Salmasius reports seeing the Anacreonteia at the library in Heidelberg in 1607. In 1623 it was given to Pope Gregory XV after the sacking of Heidelberg. It was later taken from the Vatican City by Napoleon Bonaparte in 1797, who had it rebound as two separate volumes. One of those volumes was returned to Heidelberg but the other remained in the Bibliotheque Nationale in Paris. In the seventeenth century, Abraham Cowley translated the verses into English. The poems themselves appear to have been composed over a long period of time, from the time of Alexander the Great until the time that paganism gave way in the Roman Empire. They reflect the light-hearted elegance of much of Anacreon's genuine works although they were not written in the same Ionic Greek dialect that Anacreon used. They also display literary references and styles more common to the time of their actual composition. Typical of most efforts at translation, this nineteenth-century one by Walter Headlam (1866-1908) takes the subject matter of Anacreon's verses and works them into a rhyming style typical of the English poetry written in Headlam's day. What remains is the subject of the poem, Anacreon complaining that a young woman, whom he compares to a Thracian filly, doesn't recognize his amatory skills. Todd, Mike. "The Star-Spangled Banner." An American Encylopedia. Details the connection between the above poem and the national anthem of the United States. This page was last modified on 17 March 2016, at 16:13.